The place is tiny with limited seating, but it's got a great neighborhood vibe complete with quirky, fleamarket-like decor. The cooks in the back are in plain view, chatting and laughing, chopping and dicing, stirring and sauteing to their hearts' content. There are also "secret" menu items that I only know about thanks to the super-friendly and accommodating owner. Plus, if you sign up for their e-mail list or like their page on Facebook, you'll get updated on the latest specials, off-menu items, and free stuff. Insider knowledge, yes! This wasn't quite as garlicky as I would have liked, but oh was it mushroomy. Thankfully, the mushrooms were cooked through, so they didn't have any slimy texture or raw taste. 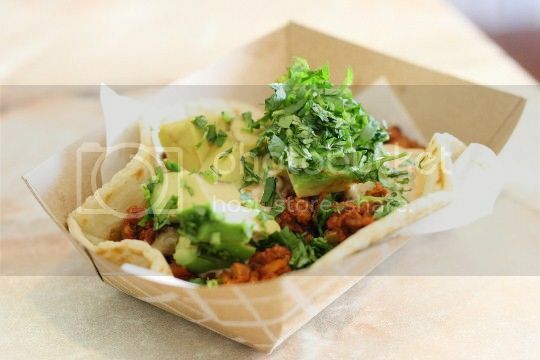 What I did love about this taco was the crunchy onion topping, not to mention the loads of goat cheese, two great additions to the earthy and pungent flavors. 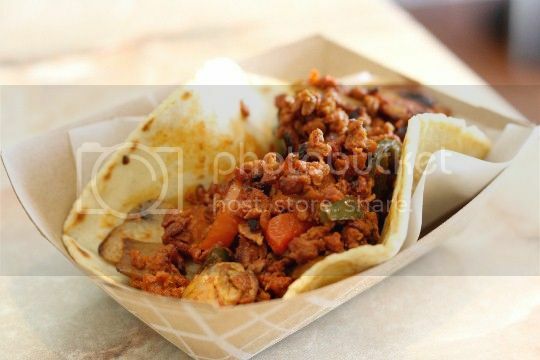 Strangely enough, I thought this taco was actually better as leftovers the next day. Maybe the garlic had a chance to set in. Most likely, I'd order this one again. I liked the idea of this taco, but it slightly missed its mark for me. Sauteed pineapple, peppers, onions, and mushrooms fill a double corn tortilla...which sounds great, but it was slightly lacking in flavor. 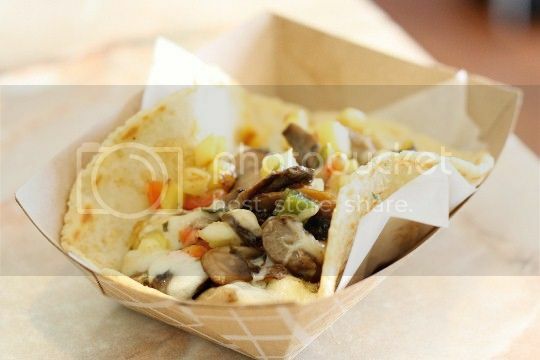 The bottom of the tortilla was filled with a thick, melted, rubbery piece of mild white cheese (called provolone on the menu, but tasted more like string cheese). The cheese is probably what threw this off the most, as I think it would have been fine with just the fruits and veggies. That part of the filling desperately needed some salt or tanginess, maybe some lime juice, sriracha, or...? And now we come to the most amazing thing ever at Mondo Taco which, interestingly enough, happens to not be on the menu. It's not a far cry from the Spanish Fly, except this taco adds fresh avocado chunks, lots of cilantro, and a rich creamy thousand island-like dressing. I'm not sure where they get their avocado from, but it might be some of the best I've ever tasted. I am a firm believer that avocado (and cilantro too, for that matter) can take any dish from good to stellar, and that's exactly what the Sister Sledge does to the Spanish Fly. This is a must-order for me! 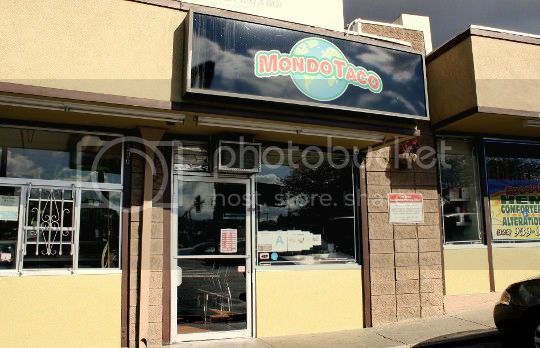 Mondo Taco is the way a taco place should be: cheap, quick, something for everyone, and TONS of flavor. 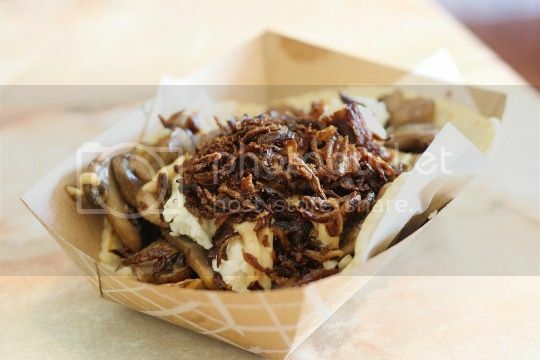 In fact, this is what some of these "gourmet" food trucks should look up to: you don't need to falsely hype up your menu, only to deliver subpar food, and then charge an arm and a leg for it. Mondo Taco definitely lives up to the hype.